- Bombs, guns and bad guys allowed. - Boys can wear tutus. - Pictures don't have to be pretty. - Paint off the paper! - Kids don't have to say "Sorry." - Love your kid's lies. 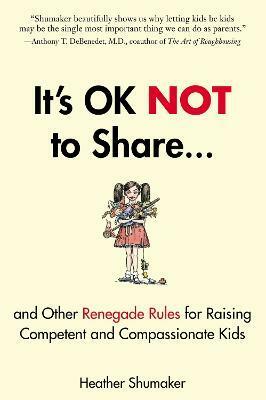 IT'S OK NOT TO SHARE is an essential resource for any parent hoping to avoid PLAYDATEGATE (i.e. your child's behavior in a social interaction with another child clearly doesn't meet with another parent's approval)! "Rarely do parenting books trigger in me an exhale. But the title alone for Heather Shumaker's new book came like that rare August breeze." -The Washington Post "On Parenting" "An insightful, sensible and compassionate book full of downright revolutionary ideas." -Salon.com "Brilliant. . . . It's OK Not to Share is an enlightening book that will make you take a second look at everything you believe." -Parents.com "Did you read the title and think, what the heck? Me, too. Not only did I read it to figure out the title, I underlined about a third-it's that good." -Melissa Taylor, ImaginationSoup.net "What an amazing book! [Shumaker] challenge[s] the parenting myths and fallacies that our society has embraced for so long." -Provider Resource Organization "A breath of fresh air." -Jane Pratt, founder of xoJane.com "These 'renegade rules' will resonate with what you know to be true, speak to what you want most for your children, and teach you how to achieve it. Don't let this one slip off your reading list." -Dr. Becky Bailey, author of Conscious Discipline and Easy to Love, Difficult to Discipline "This beautifully written book. . . provides immediate, sanity-saving answers to tough parenting questions. I highly recommend it." -Michael Gurian, author of The Wonder of Boys and The Good Son "From 'Bombs, Guns, and Bad Guys Allowed' to '"I Hate You!" Is Nothing Personal, ' the table of contents alone is music to my ears. Heather Shumaker is a healthy mom I can relate to-and I'll bet you will too, when you hear out her logic." -Paula Spencer Scott, author of Momfidence! "A refreshing change from the usual admonitions. . . Shumaker's Renegade Rules are based on what children really need." -Lawrence J. Cohen, author of Playful Parenting "Shumaker beautifully shows us why letting kids be kids may be the single most important thing we can do as parents." -Anthony T. DeBenedet, M.D. coauthor of The Art of Roughhousing "A must-read for parents and teachers. This is a book you will want with you all the time." -Daniel Hodgins, author of Boys: Changing the Classroom, Not the Child "A no-nonsense commonsense appraoch. . . As you read this book, you will begin to feel the stress of parenting melt away." Heather Shumaker is a journalist whose writing has appeared in Parenting, Pregnancy, Organic Gardening, and other publications. A frequent speaker on parenting topics and an advocate for free, unstructured play in homes and schools, she has a special passion for nonprofits; before turning to writing full-time, she worked for The Nature Conservancy, Audubon Society, Hudson River Sloop Clearwater, and many others. She holds an MS degree from the Institute for Environmental Studies at University of Wisconsin-Madison, and a BA from Swarthmore College. Heather makes her home in northern Michigan, with her husband, three chickens, and two children.